I hope everyone had a fantastic holiday season and is settling in to the New Year. We prolonged our holidays by taking our extended family on a trip to Walt Disney World. If you follow me on Twitter, you probably know that it didn’t quite go as planned. Fortunately, we’re all home and mostly recovered – just one pesky broken toe left as a souvenir! So now it’s back to reality, which means two things: writing and cooking. On the writing front, I’m happy to say that WITCH’S STONE will be available on May 3rd from Soul Mate Publishing, and CAPTAIN’S LADY will be out in August! Stay tuned here for a cover reveal for Duncan’s story very soon! And stay tuned on Twitter and Facebook for sneak peeks at Jack’s story as I write it. In the meantime, it’s been a while since I posted a recipe here. 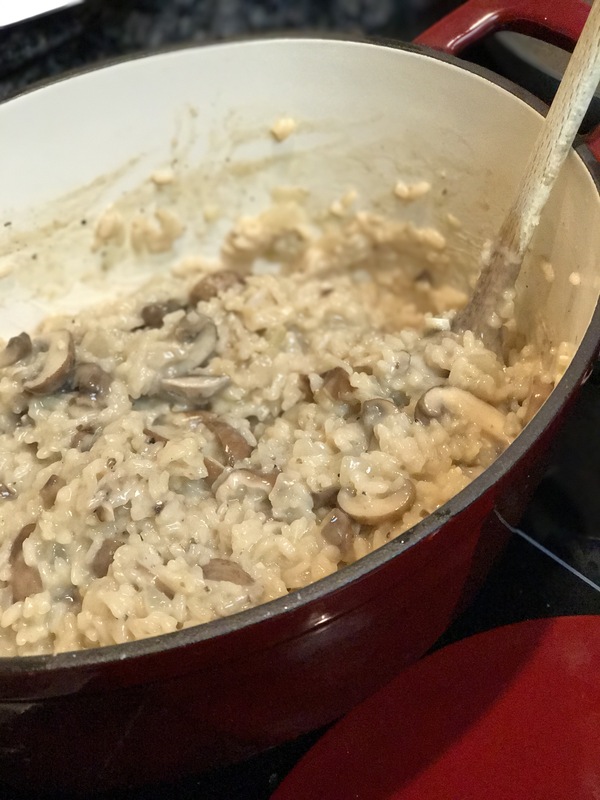 So how about some risotto? My kids love pretty much anything if it involves rice, and this is no exception. It’s also good for toddler fork scooping practice, since it holds together. I serve it in various ways; sometimes with seared scallops or roasted chicken. Tonight, I served it on a bed of baby arugula and tossed a fried egg on top. It was delicious. Heat the bacon fat over medium high heat (or olive oil, if you’re boring) in a large pot such as a Dutch oven. Sautée the onions in the fat until they’re starting to become translucent, about five minutes. Add salt and pepper to taste (I use about a teaspoon of each. I went to see Ina Garten talk recently and she got very snippy about people who don’t specify what ‘to taste’ means. So there you go.) Add the garlic, and sautée for another minute. Add the mushrooms, and stir to coat everything in the fat. Add the rice, and stir more to make sure that all of the rice grains get coated in fat. Sautée for about two minutes. Add the wine, and stir to get any brown bits off of the bottom of the pan. Let it cook, stirring frequently, until the wine has bubbled nearly completely away. Add enough chicken stock to cover the rice and mushrooms (usually about two cups). Stir, then again let cook, stirring occasionally, until the liquid is basically gone. Repeat this process with the remainder of the stock, a couple cups at a time, until all of the liquid has been absorbed and the rice is cooked through when you test it (just bite a grain – if it’s still hard in the center, keep going). Turn off the heat and stir in the Parmesan. Serve.